For millennia the Seven Sisters of the Pleiades, immortalised in the famous Pleiades star cluster, have been objects of wonder and fascination across the globe. They have been the subject of myths and legends in almost every culture on the planet. Tales of the Seven Sisters have been passed on by word of mouth, and through poetry, art, music and architecture, by Greeks, Aborigines, Chinese, Native Americans, Egyptians, Persians, Indians and Polynesians, to name but a few. The Pleiades are amongst the first stars mentioned in literature, appearing in Chinese annals of about 2350BC. The earliest European literature references are in a poem by Hesiod in 1000BC and in Homer’s Odyssey and Iliad. Humankind has always looked up to the Pleiades star constellation for guidance. Sailors have relied on the stars for navigation, and farmers for when to sow and harvest their crops – the Zuni tribe in New Mexico called the stars the ‘Seed Stars’, and when the cluster disappeared every Spring, this was the time to sow. Other cultures believe they seeded the planet and are the original seven mothers of the earth. 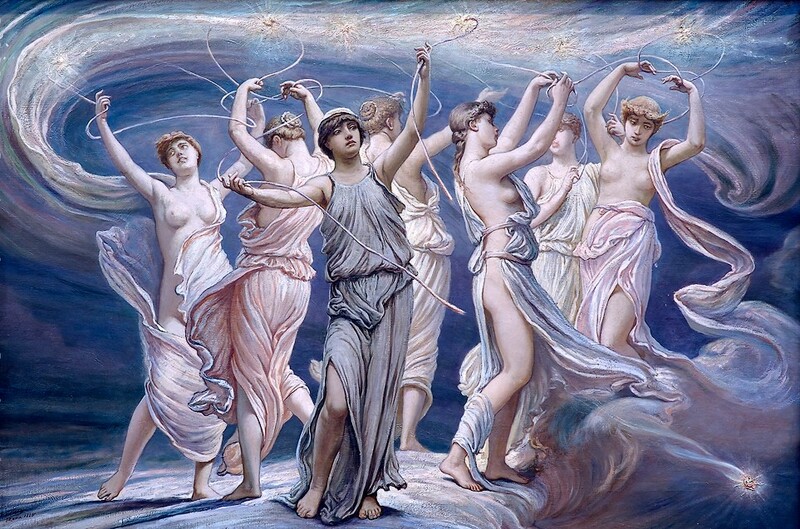 The Pleiades were seven sisters: Maia, Alcyone, Asterope, Celaeno, Taygete, Electra, and Merope. Their parents were Atlas, a Titan commanded by the god Zeus to hold up the earth, and Pleione, the mythical protectress of sailors. After a chance meeting with the hunter Orion, the Pleiades and their mother became the objects of his pursuit. To protect them from Orion’s relentless amorous advances, Zeus changed them into a flock of doves which he then set in the heavens. Zeus was also rumoured to have fathered children with three of the sisters. The Seven Sisters are also known as the ‘Water Girls’ or the ‘Ice Maidens’, due to their association with water, be it seas, rivers, rain, hail, snow, ice or frost. The Greek legends often refer to the sisters as ‘Oceanids’. Some sources claim that the name ‘Pleiades’ originates from the ancient Greek word ‘plein’, meaning ‘to sail’. Maia – is the eldest sister and known for her outstanding beauty as well as her solitary life. The story goes that despite her beauty, she was a shy, waiflike woman who preferred her own company and lived alone in the caves. The name Maia means ‘mother’ in Latin and in other translations, Maia also means ‘nurse’ or ‘Great One’. Maia was seen by the Romans as their Spring Goddess which is why our fifth month is called ‘May’. At one time, her star shone brighter than any of the others. However, the next sister’s star, Alcyone, now shines brighter – which some say symbolises sibling rivalry between the two sisters in the past. Alcyone (Ally) – in Greek mythology, Alcyone, the second sister, was known as the leader. During the Halcyon days – when the world was filled with joy, prosperity and tranquillity – she watched over the Mediterranean Sea, making it calm and safe for sailors. The son of a morning star, Ceyx, the King of Thessaly, and Alcyone were married and devoted to each other, until the day they deceived Zeus and Hera by pretending to be them. In a rage, Zeus waited for the lovers to separate before launching a thunderstorm over the seas, causing Ceyx’s boat to capsize and him to drown. Merope (The Lost Sister) – Merope is more commonly accepted as the ‘lost Pleiad’ because hers was the last star to be mapped by astronomers and is the faintest star in the cluster, not visible to the naked eye. Some legends suggest that she became lost because she hid her face in shame at marrying a mortal, King Sisyphus. Others say that Merope hid her face out of shame because her husband was a criminal, whose punishment was to roll a heavy stone up a hill to the edge of heaven though it always rolled back down. There are similarities here to Merope’s father, Atlas, who kept the weight of the world on his shoulders. Asterope (Star) – the Greek name of Asterope translates to ‘Star’ and she is traditionally portrayed as one of the weaker sisters, perhaps because this star is one of the two that shines less brightly than the others. She was the mother of Oinomaos by Ares, the god of war. Some versions of the myth claim that Oinomaos was in fact her husband, not her son, and that after having four children together, he later became King of Pisa. Celaeno (Ce-Ce) – Celaeno is commonly translated as meaning ‘melon’ or ‘swarthy’. Celaeno, like Asterope, shines less brightly than the others, supposedly because she was once struck by lightning by Theon the Younger. However she had many children including sons Lycus (wolf) and Chimaereus (part lion, dragon and goat) by the Titan Prometheus, and sons Lycus and Nycteus by Poseidon, the god of the sea. Taygete (Tiggy) – in the myths, Taygete, like Maia, valued her independence and lived alone in the mountains. Zeus also had his eyes set on Taygete and tried to seduce her. Before he could reach her, she ran into the arms of Artemis, who turned Taygete into a doe so that she could escape the clutches of Zeus. Hercules also tried to woo her. Electra – known as the third brightest star Electra bore four children, one of which was Dardanus, who later became the founder of the ancient city of Troy. Some sources claim that Electra is the ‘lost Pleiad’ after she vanished following the fall of Troy and Dardanus’ death. In Wyoming, North America, stands Mateo Tipi – or Devil’s Tower as it is now widely known – a 1,200 ft tall rock formation. As legend has it, the Kiowa tribe were moving south for the winter, when they camped by a stream where there were many bears. One day, seven young girls were playing further along the stream when suddenly some of the bears began to chase them. The frightened girls leapt onto a small rock and asked the Great Spirit to protect them. The Great Spirit heard the girls’ cries and made the rock grow upwards, with almost vertical sides, taking the girls with it, and leaving the bears unable to reach them. The bears however continued to claw away at the rock, leaving deep scratch marks and making it grow even taller, pushing the seven little girls into the stars. The Western Mono Indians believed the Pleiades stars represented a group of wives who were excessively fond of eating onions and were thrown out of their homes by angry husbands! Repenting in their loneliness, the husbands sought out their wives, but in vain. They had wandered into the sky and become stars. To the Blackfoot tribes of Alberta and Montana, the stars were known as The Orphan Boys. The fatherless boys were rejected by their tribe but were befriended by a pack of wolves. Saddened by their lonely lives on earth, they asked the Great Spirit to let them play together in the sky. As a reminder of their cruelty in contrast to the kindness of animals, every night the tribe were afflicted by the howling of the wolves that pined for their lost friends. Aboriginal tribes from the Northern Territories call the Seven Sisters the ‘Yunggarmurra Water Girls’. The sisters are regarded as the beholders of beauty and possess the magic of love. Their father, whom they called Dunia, was transformed into a crocodile to stop his incestuous ways. The Aborigines also believe that the stars wear a crystal covered ‘coat’ which explains why they shine so brightly. The Pleiades are collectively known in India as Krittika, the wives of the seven wise men named the ‘Seven Rishis’ or ‘Seven Sages’, or the six mothers of the war god Murugan who developed six faces, one for each of them. The Pleiades in Japanese culture are known as ‘Subaru’ and are usually referred to as being seven stars. ‘Subaru’ also means ‘unite’ or ‘unity’ in Japanese. However, when the car company Subaru chose the name for their business, they decided to depict only six stars in the company logo, supposedly because only six of the stars are visible to the naked eye.